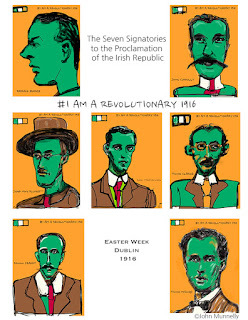 Easter 2016# I am a revolutionaryI attended my fathers small two-room national school in a country parish in County Cavan. On the walls of the school was tacked a slightly worn-at-the-edges large hard-card print of the Irish Proclamation of 1916. It was hung at the reading-eye level of a small and wondering Irish child. The Republic ... declares its resolve to pursue the happiness and prosperity of the whole nation and of all its parts, cherishing all of the children of the nation equally, and oblivious of the differences carefully fostered by an alien Government, which have divided a minority from the majority in the past. I found it an extraordinary read in among the more numerous hand-made posters declining the Irish irregular verbs known as "Sean's Verbs" and a green cross code safety poster. ... that's the green cross code."